MetaCompliance is a cyber security and compliance organisation that helps transform your company culture and safeguard your data and values. We create state-of-the art eLearning, GDPR, policy management, incident management and phishing solutions that our clients trust to help them create a better relationship with employees and regulators. The Three Lines of Defence is a popular framework for managing Governance, Risk Management & Compliance (GRC). 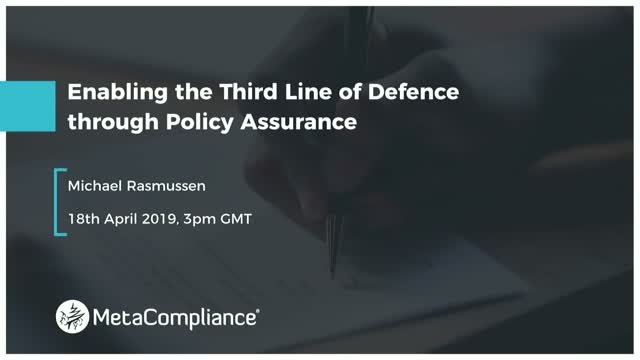 In our first webinar, we explored the policy implications of the first line of defence – the front-line employees, then we explored effective policy management and oversight in the second line of defence. In this webinar we now explore the third line of defence, audit and assurance professionals and their role in providing assurance and validation that policies are properly managed, communicated, and enforced in the organization. The third line of defence is key in providing validation and assurance that policies are properly managed and current by the second line of defence, and the third line provides assurance that the first line of defence is aware of policies and that they are lived by throughout the organization to maintain integrity, mitigate risk, and reliably achieve organization objectives. Most companies have active digital transformation projects aimed at evolving the organisation into the new digital economy. Its also becoming important in commercial relationships to be able to demonstrate that your organization has adopted best practice Privacy and Information Security best practices. Often these have to be detailed in vendor risk assessments. The problem is that these are relatively new concepts and initiatives for the majority of staff members. Often Corporate Communications for Digital Transformation projects neglect to highlight Privacy and Cyber Security requirements. On top of that, this is an area that staff view as dull and boring. Getting your senior management and staff to engage in the necessary Privacy and Cyber Security awareness projects requires innovative thinking. Our philosophy is that it is the responsibility of the organisation to make these topics palatable for employees. At this webinar we will explore tried and tested approaches to obtaining staff participation, whilst at the same time delivering audit reporting to assist with Regulator relations. How to focus on the human aspect, including the difficulty for management to maintain these initiatives. How to approach user digestion of complex InfoSec and Privacy subjects. Local Government has been managing the impact of both Privacy and Cyber Security risk for many years. However, with the implementation of GDPR and the adoption of digital transformation initiatives, there has been a significant increase in the information security risks for public sector organisations. Robert O'Brien, CEO of MetaCompliance, will be joined by Peter Grogan, former Information Governance Officer for Somerset Council, in an informal exploration of these issues and what the future of Cyber Security in local Government might look like. As hackers hone their techniques and become more targeted in their attacks, it’s important to educate staff and provide them with role specific Cyber Security training that can equip them to deal with the most up to date Cyber Security threats. The problem with traditional Cyber Security training is it is bland, boring and leads to very low levels of staff participation which poses a huge risk to the security of an organisation. To be effective, Cyber Security awareness training needs to be specific to each organisation. It should be tailored to reflect the way people really work with security in an organisation and address the threats they face on a daily basis. MetaLearning is a brand-new way of engaging staff with Cyber Security awareness. It enables organisations to create customised training for their staff from an extensive library of short eLearning courses. The courses are easy to create and can be personalised and branded to make the content more relevant to staff. The Three Lines of Defence is a popular framework for managing Governance, Risk Management & Compliance (GRC). In our first webinar on the Three Lines of Defence we explored the policy implications of the first line of defence – the front line employees. In this webinar we now explore the second line of defence, the risk, security, and policy owners and managers and their job in ensuring that policies are current and understood in the organization. Continual growth of regulatory requirements, complex business operations, and global expansion demand a well thought-out and implemented approach to policy management that is governed by the second line of defence. In order to achieve effectiveness, efficiency, and agility in policy management, organizations need to define a structured governance framework and process. However, effectively managing policies is easier said than done. To consistently manage and communicate policies, the second line of defence is turning toward defined processes and technologies to govern policies and implement an effective policy management lifecycle. This webinar focuses on how to effectively manage and govern policies and enable the second line of defense in your organization through effective policy oversight. Jingle Bells, Phishing Smells, Hackers Go Away! Phishing scams are a persistent problem for organisations at all times of the year, however there is a steep increase in the number of scams at Christmas as hackers take advantage of distracted staff to launch targeted attacks. When we’re distracted, mistakes happen, and Christmas tends to be the one time of the year when employees let their guard down which can result in a massive loss of sensitive data. Cybercriminals don’t care about your internal processes around Cyber Security awareness communication. They are not stifled by the rules around staff communication. Cyber Security awareness training needs to be a top priority and it has to be of “stand out” quality. Not the normal “techno porridge” that has been passing for Information Security and Privacy training over the last 15 years. Cyber Security awareness is about the hearts and minds of your staff and it’s one of the biggest challenges in this new digital economy. Join us at our short webinar to hear about the best practice approaches to getting employees to participate in securing your digital assets. •How Cyber Security is not about indulging in wishful thinking. Having world class cyber security is a luxury many medium sized enterprises cannot afford. Added to this, the battle to attract and retain suitable technical staff poses a huge challenge to the security and compliance posture of the bulk of mid-market companies in western economies. Defining Process & Metrics to Demonstrate Policy awareness and adherence. Policies are no good if they are left to be documents that are written and forgotten, stored on a physical or electronic shelf collecting real or digital dust. Organizations need policies that are correctly written, but also clearly understood and enforced in the environment. This webinar looks at the key metrics and process to effectively communicate policies in the environment, track awareness, enforce policies, and monitor metrics of policy adherence. Could a lack of staff education lead to an information security nightmare? For many organisations, a data breach becomes their worst nightmare. In 2018, not only has the threat of cyber-attacks increased, the risk of financial sanctions are more real since the introduction of GDPR. Halloween celebrates all that is spooky and scary, but for many organisations, nothing is more terrifying than a severe business-crippling data breach. Apart from the fines, organisations can suffer significant reputational damage and massive management distractions trying to remediate the problem and deal with the PR fallout. Staff are often the weakest link in an organisation’s defences. Only by adopting a fit for purpose staff security awareness program and through educating staff on the importance of cyber security vigilance, can a suitable response to the new regulatory environment be created. Front line employees are making risk and compliance decisions every day and can either protect or expose the organization to unwanted issues. Risk and compliance are not just about the back office of risk, compliance, and audit management but it is about the front office engagement and education of employees on what is acceptable and unacceptable and how to report issues. The Three Lines of Defence is a popular framework for managing Governance, Risk Management & Compliance (GRC). While a lot of attention has been given to effective management of the second (risk and compliance managers) and third line (internal audit) of defence, not a lot has focused on how to effectively engage the first line of defence: the employees and managers in the front line of the organizations. This webinar focuses on how to engage and enable the front lines of your organization through effective communication and training on policies and how to report issues and incidents in the organization.